ePOS-Print API is the application interface(API) to control POS printers for Web application using XML data. From Web browser of PC, tablet PC or smart phone, printing can be directly done on ePOS-Print supported TM printer. In addition, print images rendered in HTML5 Canvas can be printed. The products that ePOS-Print API is available are as follows. When firmware upgrade (TM-i Firmware Ver.4.0 or later). has been done on TM-T70-i and TM-T88V-i, ePOS-Device SDK will become available. 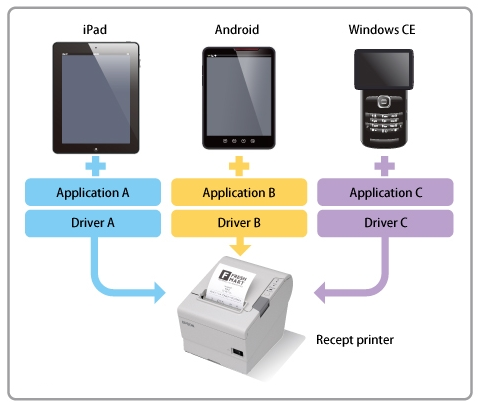 When you print a receipt from mobile devices normally, you have to develop the application to meet each OS of the mobile device, and then install the printer driver for each device. 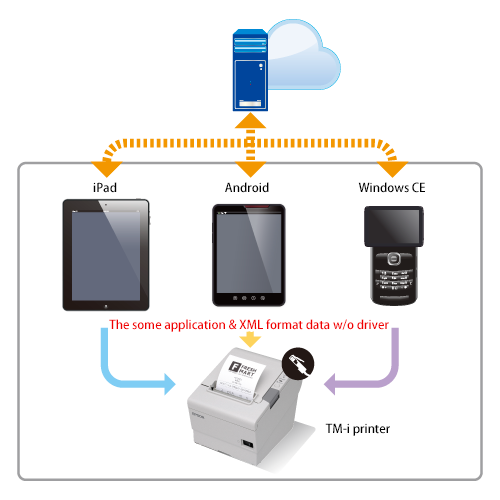 The Web application using ePOS-Print API can print directly by XML data from a mobile device to TM-i, TM mobile printer or to TM printers through TM-i. Using ePOS-Print API, you don't need to install a printer driver on each mobile device, and you can control the receipt printer simply and easily. ePOS-Print provides two APIs, ePOS-Print API and ePOS-Print Canvas API. ePOS-Print API allows device fonts to be used for printing, and barcode printing. ePOS-Print Canvas API allows printing of images to rendered in HTML5 Canvas, and TrueType fonts to be used for printing. For more details, please refer to ePOS-Print API Users manual, which can be linked at TM-i series Download page.